Where top quality storage is concerned, Freecom provides intelligent solutions for everyone. Talking of computer peripherals Freecom has it all. It's not just drives it offers. To give you maximum flexibility and connectivity, Freecom also provides a range of high technology cables and network products, giving you fast and easy access to virtually any computer or network anywhere. Freecom understands that consumers appreciate easy to install, ready to use, well priced products. 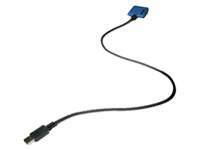 Freecom offers an ultraspeed USB cable with integrated electronic components that is compatible with all drives in the Freecom Portable and Traveller series. Only this cable allows you to burn your CD's on 4x speed on USB ports!